March 3: This article has been updated. 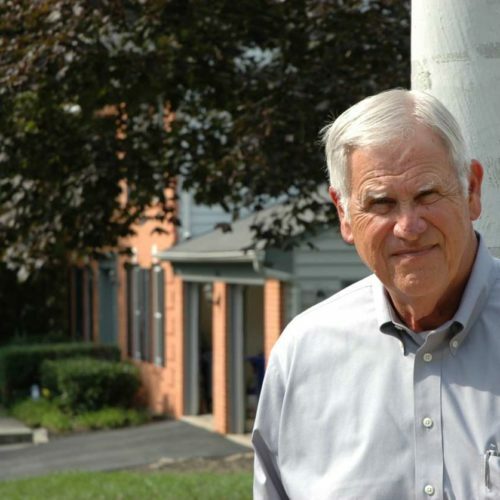 In his previous 27 years as a resident of Germantown, Maryland, a leafy suburb of Washington, Vietnam veteran Marc King had never attended a local government meeting. But for the past year, the retired lieutenant colonel has been to four community meetings held by Montgomery County, just north of the nation’s capital. And he may not be done yet. King is concerned, even agitated. And he’s far from alone. What has King, 71, and many of his neighbors so worked up are so-called small cells, the next generation of wireless technology that telecommunications firms and cell-tower builders want to place on streetlights and utility poles throughout neighborhoods nationwide. The small cells come with a host of equipment, including antennas, power supplies, electric meters, switches, cabling and boxes often strapped to the sides of poles. Some may have refrigerator-sized containers on the ground. And they will be placed about every 500 or so feet along residential streets and throughout business districts. Telecom companies say the cells will be both unobtrusive and safe, and insist the technology is needed to bring faster internet speeds required by a more connected world. But residents like King and some wireless experts say the cells could reduce property values, pose safety risks and forever sully the appearance of cities — if not properly regulated. King is one of millions of Americans facing this dilemma — but most aren’t even aware of it yet. From Germantown to Lincoln, Nebraska, from Charlotte, North Carolina, to Seattle, small cells are poised to spring up like mushrooms, with estimates ranging from a few hundred thousand to a few million more nationwide within seven years. Thousands are being erected right now. Cities and counties like Montgomery figured they could put proposals for small cells through the usual zoning, permitting and citizen input processes that other cell towers and most brick-and-mortar proposals go through. But they may be mistaken, as King and his neighbors have discovered. Politically connected telecommunications giants like Verizon Communications Inc., AT&T Inc. and tower-operator Crown Castle International Inc. say that sort of local regulation isn’t appropriate for these sleeker, smaller cells, and they want to cut local governments’ say in the process. They contend they have the law on their side, but perhaps more important, they’ve got powerful friends in state capitols — and in the corridors of power in Washington. Friends like the Federal Communications Commission, which is considering rules that would drastically limit local governments’ regulations for the placement and appearance of the small cells, and how much they can charge for them. The commission took its first cut at that in November by unanimously passing new rules for replacing existing poles on historic preservation sites. The commission plans to vote this month on rolling back the environmental review process for 5G infrastructure. Some commissioners say that’s just the start. And more than a dozen states have passed laws backed by Big Telecom to limit local regulation of wireless facilities, with more states likely to act this year. Congress is considering doing the same. President Donald Trump has joined the debate, signing an executive order in January that calls on federal agencies “to use all viable tools to accelerate” broadband deployment in rural areas on federal lands. “Those towers are going to go up, and you’re going to have great, great broadband,” Trump said. If the fight over 5G poles and cells hasn’t hit your town yet, chances are it’s coming. But even grizzled veterans of real shooting wars like King recognize when he and his neighbors can’t, as he puts it, “generate enough combat power to overcome the enemy,” rendering them powerless against the big telecom firms. Simply stated, King believes he’s about to get rolled. President Trump’s hand-picked FCC chairman, Ajit Pai, believes scaling back local rules will bring faster internet speeds to rural areas, closing the so-called digital divide. He says reducing local regulations will save wireless carriers big money, cash they can spend on expanding the super-fast networks into underserved or unconnected areas. But local officials and some wireless engineers aren’t buying the argument. Municipal and county authorities insist they want the new technology and want to work with the wireless carriers — and they admit they aren’t without some blame for not having permitting processes ready for the new technology. But they believe the changes the FCC is considering will remove legitimate local oversight governing what the small-cell facilities look like, while risking safety because poles may become overly burdened by equipment and be too close to roadways. Reducing permitting and rental fees for the companies to use public rights of way also would force cities and counties to subsidize a for-profit industry by giving away the use of valuable public land, cities and their lawyers argue. In towns like Germantown, the debate has become heated in council chambers that are normally placid. Enraged residents call telecom officials greedy and a threat to public health by bathing neighborhoods in radio waves. City officials have charged some wireless companies have deliberately ignored local rules, and they have petitioned the FCC to update radio-frequency exposure standards in hopes of easing residents’ concerns over small-cells’ health effects. King has witnessed a lot of the outbursts. After learning about the small cells from a neighbor, King decided to go to his first public meeting. There he learned he could look up online where wireless companies proposed erecting small cells. King checked his address, Spinning Wheel Drive, and saw a cell for Verizon was proposed for a streetlight just 30 feet from his house. His immediate thought, he said, was that it would reduce the value of his half-million-dollar, red-brick home. King said he called local realtors who confirmed that his home value would likely take a hit. “Nobody wants a big antenna sitting outside their bedroom window,” he said. King has wavered between giving up and finding a way to fight back. While King is skeptical he can stop the cell, he asked county executives to create a fund that wireless companies would pay into to compensate property owners whose land values drop because of a nearby small cell. So far, though, his idea hasn’t generated support in county offices. Mobilitie executives now say their relationships with local governments have improved and deals are being made. Still, neither Mobilitie nor other carriers are backing off urging a business-friendly FCC to weaken local small-cell rules. They sense the political winds are blowing in their direction in state legislatures and in Washington, and they’re doubling down, said Bennett Sandlin, head of the Texas Municipal League, which represents more than 1,100 cities in the state. Telecommunications companies say the current 4G network is becoming overloaded as more people stream more videos and use more data-heavy apps. The advent of driverless cars, smart homes, telemedicine and virtual-reality will create more demand on wireless networks, requiring more bandwidth and faster speeds. What’s needed, the wireless industry says, is 5G. The next generation network, still in development, is a combination of advanced hardware and standards such as distributed antenna systems, more fiber-optic cable, new data management practices and higher frequencies that will enable the network to carry more data up to 100 times faster than 4G. 5G will depend on so-called millimeter waves. These high-frequency bands, however, don’t travel as far as the signals 4G relies on and are easily blocked by walls, trees and even rain. So the network needs to be dense, with cells placed much closer together. That means way more wireless facilities. More than 300,000 cells are now in operation nationwide, and estimates for the number of small cells needed to make 5G work range from hundreds of thousands to millions more. The rollout of 5G will be evolutionary, with the standards for the full complement of advanced technologies expected after 2020. Small cells already are being erected with 5G tests in many cities, and as that’s happened, citizens have descended on government meetings to express their anger — from Woodbury, New York; to Liberty Township, Ohio; to Charlotte; to Pasco County, Florida; to Olympia, Washington. 5G promises to generate huge profits for the wireless companies, with as much as $250 billion in service revenue expected annually by 2025. And 5G will unleash an economic boom, say supporters of pre-empting local rules. They frequently cite a report by the consulting firm Accenture, which concluded that wireless firms will invest $275 billion over the next seven years deploying small cells, creating 3 million jobs and eventually boosting the national economy by $500 billion annually. The study appears everywhere — mentioned by FCC commissioners in speeches, cited in an official FCC docket, in wireless carriers’ comments, and in statements by the powerful Washington associations that represent them. What most don’t mention is that the study was paid for by the wireless association CTIA, one of Washington’s top lobbying spenders. The wireless industry argues that localities’ high fees, design requirements and delays in processing permits have effectively prohibited the deployment of broadband, which they argue is a violation of federal law; they’ve asked the FCC to make that clear in reining in cities and counties. 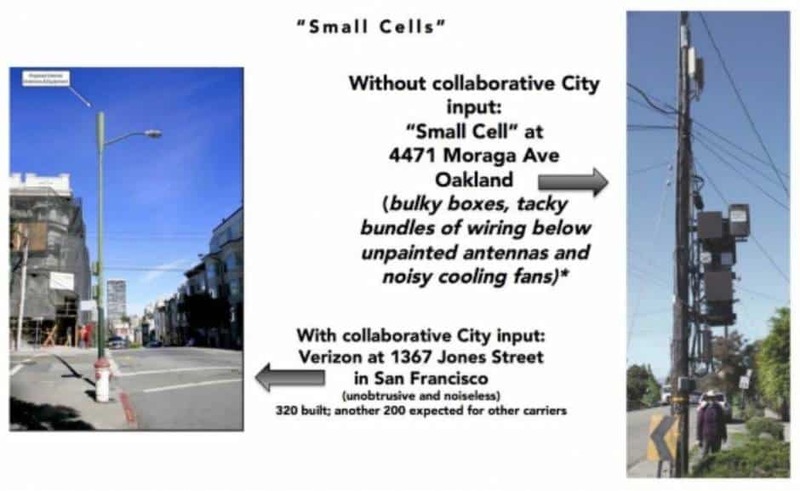 Opponents of the FCC’s push to curtail local governments’ small-cell rules have circulated this slide created by Omar Masry, a senior analyst for the city of San Francisco. Wireless carriers and the companies that build towers for them have begun flooding city and county permitting offices with applications for attaching small cells to poles and building new ones. Cities that normally see a few dozen such applications yearly began in 2016 to get hundreds, such as Houston. Montgomery County said it had at one point more applications filed in four months than in the previous 18 years. Wireless companies complain local governments can’t process the permits fast enough because their systems are set up to review applications for massive cell towers, not the small cells they claim are less intrusive. The process needs to move quickly, they say, because 5G requires so many more cells, and they want to beat other countries to set standards. The FCC issued a notice in April that it would consider rules to streamline cell deployment by reducing the time cities’ and counties’ have to review applications. The agency also said it would study, with the possibility of proposing rules later, both how the FCC could limit cities’ requirements on the look and design of small cells, and if local fees to attach to poles are excessive. The FCC also asked for ways it could amend its own rules. The agency may consider the proposals by the summer. Pai, a former attorney for Verizon, also created last year a committee of representatives mostly from the wireless industry to develop model codes that cities and counties can adopt to speed the permitting of small cells and to reduce costs to telecoms. The committee is considering proposals, which it plans to formally submit to the FCC later this spring, that run the gamut, from simply calling on cities and the wireless industry to work together to controversial recommendations such as capping what cities charge to attach to public property. Absent a state law that provides for shorter time periods, cities and counties have 60 days to rule on wireless cell co-location applications for existing cell sites if they don’t involve a significant change, as defined by federal law. They have 90 days to review a co-location application that does involve a significant change. Local governments have 150 days to process a regulatory request to erect a new site. The time frames are known as “shot clocks.” If a city denies the application in the latter two instances or fails to act on the application, the aggrieved applicant has their own shot clock, 30 days, in which to file an appeal in federal district court. Failure to act on a 60-day colocation request creates a deemed granted procedure, relief that was developed during President Barack Obama’s administration to implement provisions passed by Congress. Wireless carriers have told the FCC it should reduce the shot clock to 60 days for colocations and 90 days for new poles — and to include a provision that if a city or county exceeds the deadline, then the application is deemed approved. The wireless industry has filed dozens of comments complaining about long delays in obtaining approvals. AT&T executives claimed that unidentified local officials in California delayed the deployment of small cells by more than 800 days because they “scrutinized,” among other things, antenna designs, radio-frequency exposure, effect on property values and screening of equipment. Verizon wrote to the FCC complaining about unnamed local ordinances that “are overly restrictive,” citing provisions such as property notification requirements, protection from falling poles and landscaping rules. Cities and counties argue the delays are caused by the wireless companies themselves. Montgomery County officials submitted a filing to the FCC in March 2016 claiming Mobilitie routinely filed incomplete applications. Other local governments said they have had similar experiences with Mobilitie, including applications that had “obvious safety issues,” according to a group of local governments in 11 states and the District of Columbia. Mobilitie’s “record in many communities is not pretty,” the coalition said last year. Mobilitie officials said in an email that their relationship with local governments is part of an “evolving environment” that is leading to a better collaboration to create more appropriate approval processes. “I don’t think we’ve ever seen more progress” than has occurred lately, Jason Caliento, senior vice president for network strategy for Mobilitie, said in an interview. Just days later, Mobilitie’s head of government affairs, Kirk Jamieson, was at FCC’s headquarters in Washington meeting with top officials to urge the FCC to impose shorter shot clocks on cities and counties. City officials say less time to review applications will open the door to small-cell facilities that are unsightly and unsafe. Montgomery County resident Donna Baron opposes a small cell attached to a street light about 100 feet from her property, on the right. That’s what worries Donna Baron. 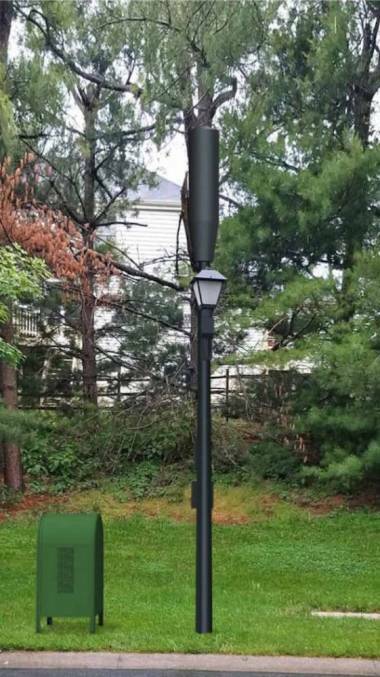 The 75-year-old retiree, who worked for Lexis-Nexis and paints landscapes and collages in her home, learned a streetlight near her house on DuFief Drive in the upscale Westleigh neighborhood in North Potomac, Maryland, was marked to become a small cell, as were dozens more within walking distance. Sitting in her sunroom, Baron points to a photo of a colonial-style streetlight about 100 feet from her house. Crown Castle told the county it wants to replace the light with a small cell and to install a ground cabinet next to it that will house other equipment. The cabinet might be disguised as a mailbox, according to mock ups distributed at county meetings. Baron’s streetlight is currently 14 feet, and Crown Castle has applied to increase the height of the pole to 24 feet, according to county records. At that height, Baron said the new pole will reach the height of roofs of nearby houses. Montgomery County is considering new ordinances, expected to be voted on this spring, that would restrict some poles in neighborhoods to an increase of just five feet instead of 10 feet. If approved, the pole near Baron’s house would be limited to an overall height of 19 feet. Verizon didn’t respond to requests for comment. The FCC said it wouldn’t comment on municipal and local opposition because the it was still collecting information from the public on the proposed rules and inquiries. A visualization of a small cell attached to a lightpole, with a faux-mailbox power supply nearby. Many neighborhoods have power lines and cables buried in the ground, like in Baron’s Westleigh neighborhood, and residents want any lines that are part of the 5G network buried as well. But wireless companies have asked the FCC to consider limiting or eliminating those requirements, too. Verizon told the FCC in June that burying cable is too costly and burdensome, and would actually amount to a “substantial barrier” that prohibits the deployment of broadband, a violation of law. 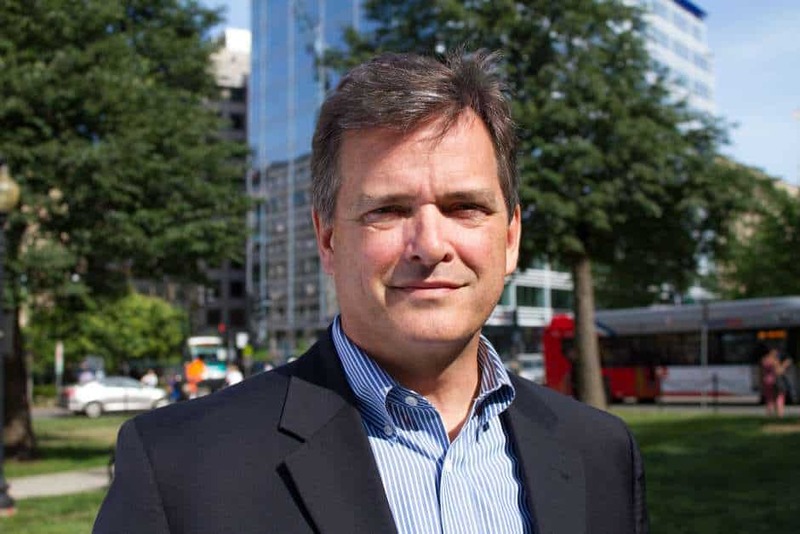 Michael Mattmiller, former chief technology officer for the city of Seattle, said residents in the Puget Sound area are sensitive to “maintaining the integrity of the aesthetics of our environment,” which means they want a say in the design and placement of small cells. Mattmiller said the city has worked cooperatively with Verizon on a plan for small-cell permitting and with Comcast Corp. on fiber-optic-cable attachments, including agreements for the two companies to pay for extra staff to review applications and identifying certain attachments that can receive streamlined reviews. That means Verizon and Comcast are ahead of competitors in deploying their technology because they have been transparent with Seattle officials, Mattmiller said. But such collaboration may be for naught if the FCC gives telecoms what they want, Mattmiller said. It creates “a fear of new utility poles dotting the landscape indiscriminately without much thought of the needs of the community and where they can be best placed,” he said. Wireless companies are also asking the FCC to cap how much local governments charge for applications and for renting space on publicly owned poles. AT&T said three cities in California assess fees of between $2,600 and $8,000 annually per attachment, and a “Georgia municipality is considering an annual fee of $6,000 per node.” Crown Castle claimed Newport Beach, California, adopted an annual charge of $10,800 per small-cell site. Asked to comment on rolling back local rules, AT&T pointed to documents it has filed with the FCC, including one in which AT&T argues charging fees not based on cost violates the federal Communications Act, which blocks local governments from prohibiting broadband services. Wireless companies want the FCC to rule that local governments should only charge an amount to cover the labor to process permits and to maintain the right of way. They object to local governments charging annual rental fees, saying the charges unfairly target profitable wireless carriers to fill municipal budget shortfalls. 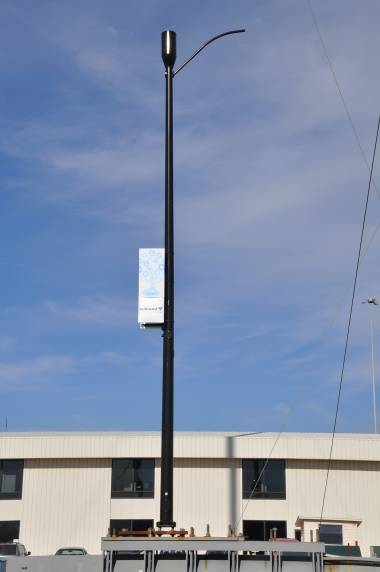 In Lincoln, Nebraska, wireless companies who agree to use a city-designed small cell, above, receive streamlined approval. Cities and counties say charging a market rate for the use of public property is their fiduciary responsibility in representing residents who own the property. They say they have the same right that private property owners to charge telecoms an annual fee to attach a cell to their buildings. That’s how David Young sees it. As manager of fiber infrastructure and rights of way for Lincoln, Nebraska, Young said he understands the wireless carriers’ frustration with some cities but said he is puzzled by how much wireless carriers are asking the FCC and state legislatures to reduce fees, which can be less than a tenth of what wireless carriers have agreed to in the past. Over the past couple of years, Young negotiated with Verizon, Mobilitie and Extenet Systems Inc., another network operator, to set an annual pole attachment rental rate of $1,995 a year for small-cell poles in Lincoln. Young set the price by researching how much private building owners charge for attachments, what the going rate is for connecting to macro towers, and then taking into account Lincoln’s high population density, which means a small cell can reach more people per square mile, making the land more valuable. When the city’s projected 400 small cell sites are completed, Lincoln expects to receive about $1 million a year from attachment fees, money that will be used to maintain its broadband network. The companies understood the city determined the rate through market analysis and “they were quite happy to pay the price that we asked,” Young said. Lincoln was close to losing that deal last year, when the Nebraska Legislature considered a bill aggressively pushed by the wireless carriers that would have capped the rate at the same level cable companies are charged, about $95 a year per pole or less than 5 percent of what Lincoln is now getting. The bill failed but was reintroduced this year. This time, the measure caps rates at $20 a year per pole, Young said. Texas cities weren’t so lucky. Last year the state Legislature passed a law setting a $250 annual cap per pole on how much cities in the state can charge carriers. Lobbying hard on the bill was AT&T, which typically spends more than $4 million a year on about 100 Texas lobbyists to work the state Legislature, more than three times the second-largest spender in the state, according to the National Institute on Money in State Politics. The Texas Municipal League had just 15 lobbyists and spent about $437,000. The league’s Sandlin said the first versions of the bill had set the rate at $1,000 a year per pole. The rate dropped in every subsequent version of the bill, as lobbyists representing carriers and the cell-tower operators worked state lawmakers, he said. A group of Texas cities, led by McAllen, filed a suit last year against the state, arguing the Texas small-cell law violates the state constitution, which forbids the state Legislature from forcing cities to grant something of value to corporations. The $250 is far below the annual compensation Texas cities were receiving for wireless pole attachments, which they say averaged between $1,500 and $2,500 a year, and would cost Texas cities about $1 billion in lost revenue over eight years. That, the lawsuit argues, constitutes a gift to wireless companies. Lawyers representing Texas argue the state has the authority to cap municipalities’ pole rental fees. In oral arguments in December, a judge denied the state’s motion to dismiss the suit and last month denied the cities’ request for a temporary injunction. The suit is expected to go to trial later this year. Texas is one of 13 states — including Florida, Virginia, North Carolina, Minnesota, Ohio, Arizona, Kansas, Colorado, Indiana, Iowa, Delaware and Rhode Island — that have passed laws since 2016 pre-empting local governments’ ordinances for permitting, fees and aesthetics. Many of the laws are based on 11-year-old model legislation written by the American Legislative Exchange Council, a self-described free-market think tank made up of mostly Republican state lawmakers and funded by corporations and trade groups, including telecommunications companies. ALEC “re-adopted” the model bill in 2015, just a year before some states began passing small-cell laws. More bills to pre-empt local control have been introduced this year. Virginia may expand on the small-cell law it passed last year, which allows wireless carriers adding small cells to existing structures not to go through a public hearing process, if the new cells meet a certain size limit. The new bill circulating in the General Assembly would pre-empt public hearings on new small-cell poles that don’t exceed 50 feet. Wireless carriers would only have to fill out an application saying the new structure was within the limit and the city would be required to approve it. MinhChau Corr, an assistant attorney for Arlington, Virginia, said citizens should retain the right to provide input, and the city should have authority over what they look like. Congress is also weighing in — in rare bipartisan fashion — on the side of the telecom firms. Numerous bills in both the Senate and House would ease regulations and fees for erecting cells on federal lands, such as a bill the Senate passed last summer that would exempt certain small-cell deployments from environmental and historic reviews. The bill, which the House has yet to consider, is sponsored by South Dakota Sen. John Thune, the Republican chairman of the Commerce, Science and Transportation committee, and Sen. Bill Nelson, D-Fla., the ranking member of the committee. Also last year, Thune joined Democratic Sen. Brian Schatz from Hawaii to circulate a draft bill that rolls back local government control over wireless facilities including small cells, including shortening the permit review times to 60 days on applications to collocate wireless facilities and 90 days for other wireless applications — the same time frames wireless providers are asking the FCC to consider. Wicker and Thune are among the top 25 senators who have received the most campaign contributions from AT&T and Verizon since 2010, pulling in $32,500 and $30,500, respectively, according to the Center for Responsive Politics. Schatz has received $29,000 from the two carriers, the third most among senators since 2014, when he ran his first campaign. With such bipartisan support in Congress, and with an FCC that is sympathetic to telecoms, cities view their control over small cells as slipping away. That leaves people like King resigned to what is coming.